“There is something to be learned from a rainstorm. When meeting with a sudden shower, you try not to get wet and run quickly along the road. But doing such things as passing under the eaves of houses, you still get wet. When you are resolved from the beginning, you will not be perplexed, though you still get the same soaking.” – from the Hagakure, a famous Samurai manual. I love Samurai. Ever since I was little I have been fascinated with their way of life and how they mixed the Zen Buddhist teachings with the ice-cold warrior mentality. Let’s face it – Samurai are extremely cool! In this series I want to introduce you to a few of the core Samurai principles and how you can apply them to your modern way of life. A Samurai will always act with poise and discipline. It would be a rare event to see a Samurai lose his cool and lash out with emotion and passion. Regardless of whether he was under enemy attack, training with his partner or spending time with his master the warrior would always be disciplined. Nothing has changed since the time of the Samurai – discipline is still essential. Whether you are looking to climb the corporate ladder, improve your family life or develop more wisdom it is essential that you have discipline. When you lose that you lose your focus. 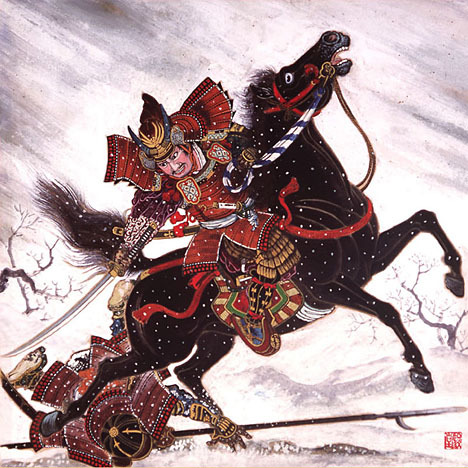 The Samurai’s main weapon was the Katana (long sword). This weapon was so important to the Samurai that they would often give it a name and talk to it like a living creature. The Katana was known as the soul of the Samurai. However, when the had to check their Katana at the door they carried their smaller Wakizashi by their side. This smaller blade never left the Samurai’s grip, not even when he slept. Sometimes when the warrior lost his primary weapon in a fight he would call upon his Wakizashi to finish the job. As such he was never without a weapon. This is an extremely important lesson for modern life. I am not saying that everyone should carry around two whopping great big swords in their daily activities. That would be madness! What I am saying is that it is important to have a backup plan for that rainy day that is sure to happen. Diversifying your investments is a good idea in case your main revenue stream dries up. Make sure you are never left without a weapon. For a Samurai there is nothing more important than honor. They lived their lives in a very honorable way. Many scholars will argue, however, that the Samurai’s honor was somewhat perverted and often mistaken for an inflated sense of ego. For the most part though these warriors were a very honorable bunch. This is very important in today’s modern world. So many people are trying to lie, steal and cheat. A Samurai would never do this for fear of losing their honor and shaming their family and master. I think this is an important personality trait that we need to see more of in business, commerce and 21st century life. We need more people who see honor and ethics as being more important than money and status. The Samurai were always studying, practicing and training. He would never let a day pass without spending several hours practicing his martial arts, studying the Sutras of Zen Buddhism and doing a zazen meditation. The Samurai understood that in order to be perfect (and they were perfectionists!) one needed to devote constant attention to studying and training in one’s art without ever giving up or losing enthusiasm. This devotion to study and practice is something that is lacking in many people’s lives. We really want to achieve certain goals but we really don’t want to put in the study and effort that is going to get us there. Furthermore, once we attain certain goals (like a good job) we stop studying and just meander in our comfortable equanimity. The Samurai way is to keep studying and keep practicing and keep getting better. I would like to be like that. Catch Part Two in our Samurai Lessons series. I recently started to read your blog, and I really love it. Although, I’m new to meditation and can see the benefits of the buddhist way of life, although I’m having some trouble fitting it in with my normal way of life. A small request, do you know more great websites/blogs I could pay attention to in order to learn more? Hey Michael. Glad you have subscribed! You are missing a ‘Y’ in the first paragraph. The word ‘the’ should be ‘they’. i love it its good to see that people besides me feel the samurai saw things the way they should be seen. Very inspirational. Everyone can learn something from the ways and philosophies of the samurai and their culture.